Speak to a Vacation Expert! Our travel specialists are available to answer any questions and help find the perfect vacation for you. Located in the heart of Saint Lawrence, a bustling South Coast hotspot comprised of a stunning beachfront, colorful nightlife, and superb restaurants and lounges, Sandals Barbados adds luxury all-inclusive elegance with beautifully-appointed rooms and suites, gourmet dining and more. Location - Southern Barbados on Maxwell Beach just outside of Bridgetown, the capital of Barbados and a major cruise port. Grantley Adams International Airport (BGI) is located nearby approx. 15 minutes away from the resort. Atmosphere - $65 million dollar renovation completed in 2015 puts Sandals Barbados among the most modern and stylish resorts within the Sandals brand. Layout & Design - Currently, 288 rooms & suites on 10 acres. 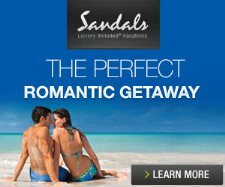 Sandals Barbados renovation plan includes total of 11 restaurants. 24-hour room service available for all butler level room categories. Bayside (Intl) - primary restaurant serving breakfast, lunch, and dinner. Resort casual, no reservations. Butch's Chophouse (Steakhouse) - Resort's signature restaurant and first of its kind within the Sandals Resorts. Named after Sandals Founder and Chairman Gordon "Butch" Stewart. Kimonos (Teppanyaki) - Fun atmosphere with dishes prepared at table. Indoor air-conditioned setting. Resort evening attire, non-smoking, reservations required. Schooners (Seafood) - Beachfront serving Caribbean seafood specialties. Soy (Sushi) - Resort casual, no reservations. Mariner Seaside Bar & Grill (Beach Grill) - Beach grill offering lunch favorites and afternoon snacks. No dress code, non-smoking, no reservations. Cafe de Paris (Patisserie) - Freshly baked pastries & ice cream. No dress code, non-smoking, no reservations. Bombay Club (Indian) - First Indian restaurant among the Sandals resorts. Mariner Seaside Bar & Grill (Beach Grill) - Sandwiches, salads, and snack favorites. Non-smoking, no reservations. Pools with swim-up bar, whirlpools, and beach. Red Lane Spa (additional cost) featuring full array of services. Air-conditioned and fully equipped fitness center. Scuba dive & snorkeling boats and full range of water sports. Resort scuba certification & PADI Dive certification available at additional cost, night diving available. 2 day/night tennis courts. Additional land activities available such as beach volleyball and pool tables. Full schedule of nightly theme parties and evening entertainment throughout the week. Gift & retail shops located on property. Rooms are located in either the Ocean Village or Caribbean Village. All accommodations with king bed, TV, refrigerator, and Sandals standard room inclusions, WIFI service (complimentary with Club level and Butler categories. Concierge & butler rooms with fully stocked complimentary bar. (O1B) Ocean Village One Bedroom Butler Suite - Separate bedroom and living room. Butler, concierge, 24-hour room service. (S1B) Crystal Lagoon Swim-Up One Bedroom Butler Suite - Separate bedroom and living room. Swim-up pool access from patio. Butler, concierge, 24-hour room service. (1B) Crystal Lagoon One Bedroom Butler Suite - Same as S1B but upper floor with balcony overlooking Crystal Lagoon pool. Butler, concierge, 24-hour room service. (OPT) Ocean Village Penthouse Beachfront Club Level Suite with Tranquility - Top floor with balcony, beachfront views, concierge and room service. (OBT) Ocean Village Beachfront Club Level Suite with Tranquility - Same as OPT but lower floor, beachfront views, concierge and room service. (OJS) Ocean Village Club Level Suite - same as OBT, but no beachfront views. Concierge and room service. (HJS) Ocean Village Honeymoon Club Level Suite - same exact as OJS. (LS) Crystal Lagoon Club Level Luxury Suite - Balcony overlooking the Crystal Lagoon pool. Concierge and room service. (SLX) Crystal Lagoon Swim-up Club Level Luxury Room - Patio access to Crystal Lagoon pool. Concierge and room service. (LX) Crystal Lagoon Luxury - Balcony overlooking the Crystal Lagoon pool. (GL) Caribbean Village Grande Luxe - Garden views. (PR) Caribbean Village Premium - Garden views. (HPR) Caribbean Village Honeymoon Premium - Same exact as PR. (DL) Caribbean Village Deluxe - Garden views. Copyright 2015, www.simplycouples.com, All Rights Reserved.